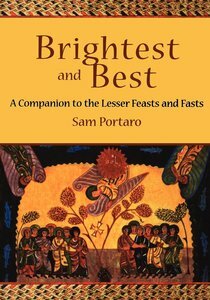 In these meditations on the lesser feasts and fasts of the church calendar Sam Portaro asks the question, What do these saints and commemorations have to say to Christians today? His answers are often surprising and always thought-provoking, with fresh insights into the lives and teachings of those who have gone before us in the Christian faith. The cycle of the year begins in Advent with St. Andrew and ends in late November with Kamehaneha and Emma of Hawaii. Each reflection looks at the scripture readings for the day and focuses on a distinctive attribute of the saint or feast in the light of contemporary questions of faith, mission, and community. Saints of the distant past such as Columba and Agnes, Cyprian and Augustine, Thomas Becket and Catherine of Siena are included, as well as those closer to our own day Charles Wesley and Julia Emery, Martin Luther King, Jr. and Elizabeth Cady Stanton, Evelyn Underhill and Jonathan Daniels. Following the calendar provided in Lesser Feasts and Fasts, meditations on the holy days of the church seasons are also included, such as All Saints and the Epiphany. Brightest and Best is designed for a variety of Christian education purposes, including adult forums, confirmation classes, seasonal presentations, clergy groups, and groups of students and young adults. It is equally useful for individuals seeking varied and interesting devotional reading. Although based on the church year, each chapter is discrete and readers can focus on any event or person and begin at any season. Since these pieces began as homilies in a college setting, they are useful as a preaching aid and could be the basis of a homily at a midweek service.